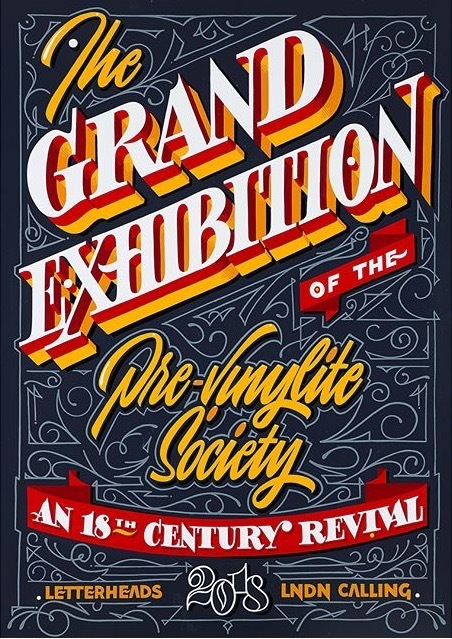 The Grand Exhibition of the Pre-Vinylite Society: An 18th Century Revival is a sign painting exhibition presented in alliance with London Letterheads. The show directly references an exhibition of signs that took place in London in 1762. The original Grand Exhibition of the Society of Sign Painters opened on April 22, 1762 on Bow Street, Covent Garden. The exhibition was a satirical display of pictorial signboards, some painted specifically for the show (purportedly by William Hogarth) and some taken clandestinely from the city streets in the aftermath of a city-wide sign ordinance which required all projecting signs to be removed. One of the few surviving objects from this exhibition is its companion catalogue, which playfully and often facetiously describes the pictorial signs for the 18th century viewer. For our Grand Exhibition of the Pre-Vinylite Society, the artists work directly from the 1762 catalogue to translate the descriptions into contemporary lettering and pictorial styles. Each artist interprets a description from the original catalogue by lettering it verbatim, rendering it pictorially, or by utilizing both techniques. While this exhibition references 18th century British signs, it is not a replication or reenactment of the 1762 Grand Exhibition. Instead, this show is a contemporary interpretation, or “revival,” of the historic event. In the 256 years since the men behind the Society of Sign Painters used the medium of sign painting to express their varied views on 18th century London life, sign making has remained an integral method of public expression and demonstration. Our Grand Exhibition of the Pre-Vinylite Society is a celebration of 21st century sign painting as told by a global community of sign painters, using the historic occasion in 1762 as inspiration for their work. Drum roll please! It's with great pleasure that we have moved to a bigger premises at 47 Roman Road, London E2. Our time on Bethnal Green Rd was a great adventure: the hectic fit-out, the random guest appearance of the local priest at the opening party, making sixteen meters of reverse glass signs in a 240sqft space, the amazing clients and commissions from London, the UK and abroad and the the wonderful neighbourhood friends we made. Our new space is nestled between a lovely Italian coffee shop and the London Buddhist Centre and we are excited to expand into a much larger space set over two floors giving us the room for more ambitious work, processes and classes. We recently had the pleasure of making this gold leaf panel for a private client using white gold to create the mirrored background. We went to town on this using pearl inlays, fades of gold, burnishing effects and all manner of fancy details. Another piece was for the guys over at The Full Nelson in Deptford, this piece included some bevelled edges, variegated leaf and pearl inlays which was then framed up by the wonderful Craig Keenan. Also keep your eyes peeled for us on Channel 4 on the 2nd of August, we will be appearing on Old House New Home with the wonderful George Clark with a bespoke gilded panel. As we approach the summer, we are also coming up to one of the highlights of the year: Letterheads 2018. This year will see over 200 sign painters, letterers and calligraphers from over 25 countries descend on our home turf for a week of lettering, learning and sharing techniques with like mind people of different generations! The Letterheads was set up in 1975 by seven sign writers in America who wanted to keep the craft alive by sharing their expertise to the younger generations. We are honoured to have been given the task of making the artwork and co-organise the event with Better Letters, Alice Mazzilli and A.S. Handover. The Pre-Vinylite Society will be hosting an exhibition to run along side the letterheads meet at theBargehouse at the Oxo Tower. 'The Grande Exhibition' will be an unmissable show featuring up to 30 top sign painters creating their interpretations of the original artwork from the 1762 'Society of Sign Painters' Catalogue. It will be open to the public from the 16th - 19th of August. Armstrong Audio, run by Shamil and his father Mr T, was established back in 1932 in Camden, it was then taken over by Mr T in the 80's and relocated to Walthamstow. Last year Shamil decided to expand the business into a coffee shop, and asked us to come in to work on the full scope of design, hand-painted fascia, gilded windows, wall offerings, hanging sign and A-board. We also recently created an A board and Hanging Sign (to match their gilded glass fascia) for the lovely folk over at Pentreath and Hall, check out our Instagram for some snaps. The cool cats from Clutch Magazine Japan came to visit us at the shop to more about sign writing and lettering and featured the interview as well the cover story for issue 59 a little while back. Following that we were super happy to be asked to work on their logo and sign writing for their flagship store 'Clutch Cafe' now open on London's Great Portland Street! One of our favourite activities is working with the locals, a recent highlight was smashing out a couple of show cards and a fascia for the new guys on the block - Butcher and Cook, who make a mean sandwich! Check out their sausage roll Saturday's! Day courses at Luminor are intended for beginners who are interested in learning how to design and paint lettering by hand, just the way it used to made before the advent of digital design. The workshop begins with a crash course in calligraphy: covering Roman, Blackletter, Italic, Brush Script and Copperplate. Following that we will explore the drawing techniques for block lettering and how to use sign writing brushes and tools to paint the lettering. For the 2nd half of the day we will look at layout and design elements and finally make a quick paper sign to take away at the end of the day. To express an interest in our next workshop please email our Studio Manager Shona on producer@luminorsignco.com, there are limited spaces and we work on a first come first served basis. Happy 2018 from The Luminor Sign Co! 2017 was a big year for us here at Luminor. We got the keys to 145 Bethnal Green Rd and set about bringing London’s first sign painting shop in 40 years to life! This leap of faith was only made possible by the lovely folks who have come to us since we opened for signs and lettering. We’d like to take a moment to reflect on some of these great projects and look forward to our plans for 2018. 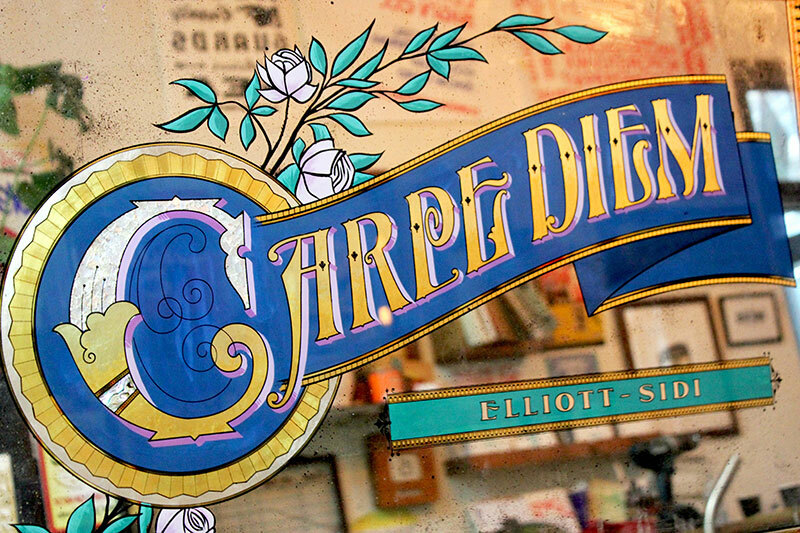 As well as sign painting and gold leaf, we also love working on custom hand-lettering and branding projects. When it came to designing Luminor's own business cards we wanted to go to town on the design and print. Rather than using existing typefaces, the entire design was drawn custom and printed by our good friend Thomas Mayo who did us proud in white and gold foil. If you’re looking for quality print in London look no further! September saw our amigos over at Breddos Tacos opened up their second joint over in Soho. Following our first collaboration at their Clerkenwell restaurant, we were honoured to be asked back to bring some Mexican flavour to their new shop front, windows, menus and a folky style margarita menu. Founders Nud & Chris started off with a makeshift taco hut in a car park in Hackney back in 2011 and have since done residencies, cook books and now two stylish eateries serving some of the best Mexican food in town. They trusted us to just ‘do our thing’, and had a blast! Great to be part of the team setting up this awesome venue. Six craftspeople from around the UK were challenged by Meantime Brewery to create a piece of work in six weeks (the same time it takes to brew a beer) as part of their ‘Make Time For It’ campaign. We created a gilded panel with mirrored gold, a fade of different gold leaf, pearl in-lays and a decorative border. Bristol’s finest James ‘The Killer’ Cooper aka Dapper Signs joined us for a week of pay-what-you-want paper signs and window splashes back in October. Ged and Coop have been painting together since 2012 so it was great to work side by side for the likes of Caravansérail, Monty’s Deli, Flash Back Records, Bad Sports, Curious Duke Gallery and Breddos. Oh what a week! 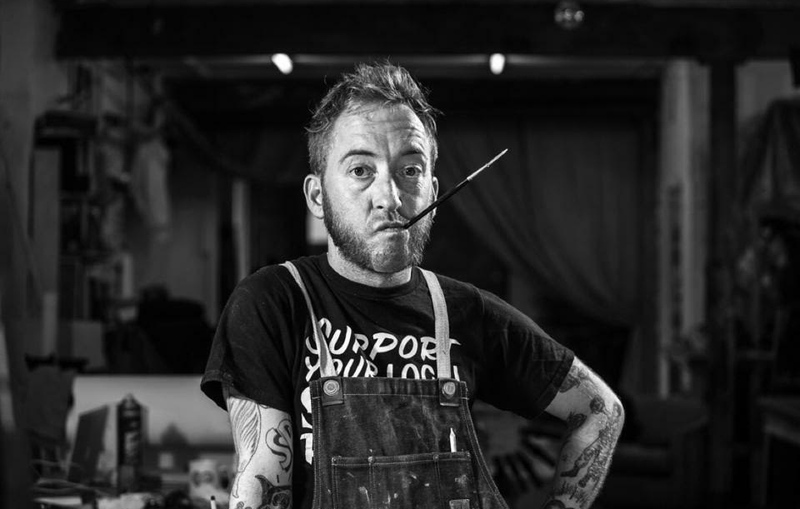 Our next takeover with Norway's finest 'Frisso' - Letterer and Sign Painter extraordinaire, from 12th to 18th February at Luminor Sign Co.
Having taught calligraphy and lettering at Universities and art schools in the UK and abroad since 2013,Ged will now be offering day and weekend courses in 'An Introduction to Calligraphy & Brush Lettering' here at the shop. We are honoured to have been contacted buy the sign-making tutors from Arcus Technical College over in the Netherlands who will be joining us in February. We will be hosting the next one day workshop on the 3rd of March, if you are interested in joining us please enquire here. 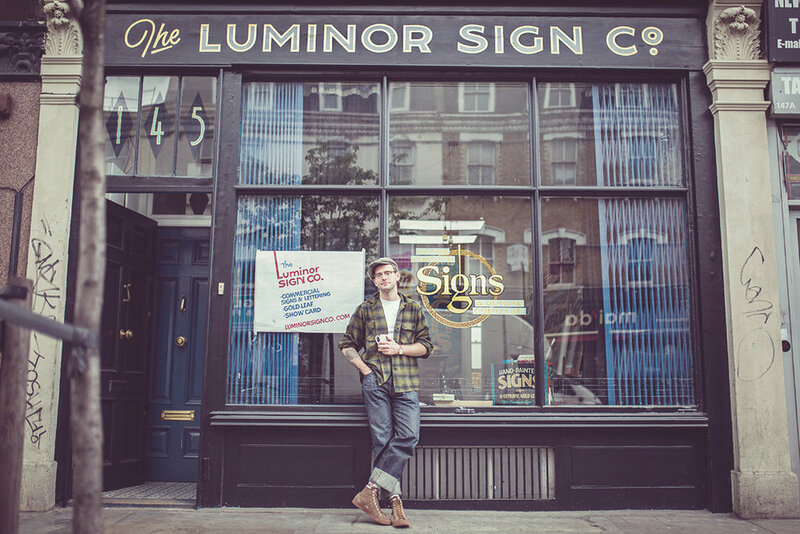 A little about Luminor Sign Co: Lettering artistGed Palmer opened up shop at 145 Bethnal Green Road in March 2017, basing the shop on the original 'Luminor Sign Co' which stood on the corner of Old St & City Rd and closed it's doors in 1938. We have been celebrating the change of season here at Luminor Sign Co. Whilst welcoming the crisp weather here in London we have also been looking back at some of the great projects we have worked on over the summer. One of our favourite summer projects was working with the wonderful Anna Mae's. We were approached by the dynamic duo Anna & Toni 'Macaroni' back in January and asked if we could bring some extra flavour to their beloved 'Burt Reynolds', a 1980's GMC truck. From there we went full throttle, doing all their menus and fascia signs for their 'Mac not Crack' events catering company. Anna Mae's set up their shop back in 2013, hitting the ground running with appearances at all of the Summer's best events and swiping a spot in The Guardian 'Top Ten Street Foods' . They fast became our Summer favorites and we even managed to catch up with them for a macaroni and boogie at this year's Shambala festival! We're honoured to be working closely with our friends at the fabulous Cafes Belleville, Paris. After giving us the task to create their branding back in 2014, this amazing Paris based coffee company has gone from strength to strength, opening their classic 10th arrondissement outlet, La Fontaine, and now their second roastery in the Belleville neighbourhood of Paris. We've been lucky to join them step by step, producing design for print and web as well as all the hand-painted signs and gold leaf work in their venues in Paris. Over the summer we were asked to create a beautiful bespoke mirror for their new cafe with the text: 'Jus De Chausette EXTRA' which translates as 'Sock Juice', an expression in French for bad filter coffee. We had the chance to add all the bells and whistles on this one: mirrored gold outlines, a gradient of 24, 22 and 18CRT gold leaf, pearl inlay, with a distressed mirror background, finished off with a decorative Art Deco border. Now everyone is back from their holidays and settling into Autumn, we've been inspired to create an array of show cards for various businesses, expressing the seasonal change and giving some pop to folk's window displays. Show cards - are paper or card signs used in shop displays and were common place up until the 1960's. Lots of sign painters operated 'card shops' which specialised in just this type of sign, made quickly using calligraphy pens and brushes. This design was based on a design by a London Show card writer named W.A. Vickers who operated in the 1950's. We are stoked to announce the impending arrival of Jimmy 'The Killer' Cooper aka Dapper Signs hailing from the fine city of Bristol. He'll be the first of what we hope will be an on-going series of sign painter's 'take-overs' here at The Luminor Sign Co. For those who know Coop's work, there's a lively bounce and old school flavour (often peppered with his characteristic salty language!) to his work that is instantly recognisable and still wonderfully original – and always fun. For the week of the 23rd to the 27th of October Coops and Ged will be producing some snappy window splashes and paper signs for local business in and around the Brick Lane area. As well as some requests from neighbours such as Rose DIY, Hunkey Dorey Vintage and Flashback Records we'll also be taking quick commissions on a pay what you want basis - just don't expect to have too much control on the exact message or style! Feel free to drop us an email with any requests. 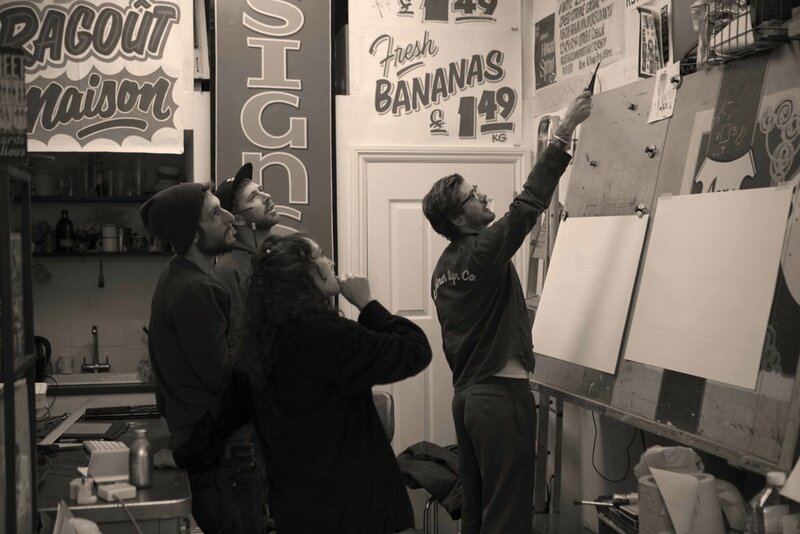 A little about Luminor Sign Co: Lettering artistGed Palmer opened up shop at 145 Bethnal Green Road back in March, basing the shop on the original 'Luminor Sign Co' which stood on the corner of Old St & City Rd and closed it's doors in 1938.